This weekend was marked by two important events: the Cubs reaching the World Series and our Fall Open House for prospective families. It was a pleasure meeting all of the students and families that came out to learn more about us. We are also grateful to have a community of current students and families that spent their Sunday afternoons sharing stories about their GCE experience. We look forward to hosting more events and meeting more families. 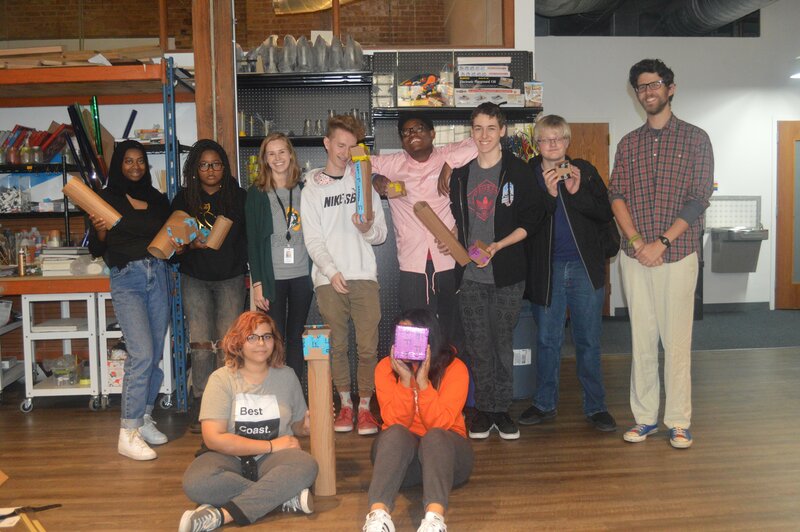 In preparation for their next Action Project, the Juniors in the Design & Engineering class worked with Bailee from the James Dyson Foundation to learn some basic prototyping skills using cardboard, X-Acto knives, markers, and rulers. Armed with their tools and a set of instructions, the students built a cube and a cylinder, two basic shapes crucial to product design. Thank you to Bailee for helping us be more prepared for creating effective models. Sophomores in the Population class visited the Oak Woods Cemetery in Greater Grand Crossing to collect data and identify patterns by looking at tombstones. In the second unit of this STEAM course, students have been pursuing the guiding question, what does the story of population suggest about the future?. In their pursuit of an answer, students have been studying concepts of genetics from Darwin and Linnaeus, genotype and phenotype, and how to calculate allele frequencies. The purpose of this Field Experience is to investigate the guiding question, how can we quantify the status of a species?. The students will visit Oak Woods Cemetery to observe tombstones for specific birth dates and death dates. Students will collect a set of data that they will use to complete calculations and identify patterns. The Freshmen in the Water class are studying the water cycle. In the process, students learned that infiltration is an important part of the cycle because as the water passes through layers of soil and sand, it is filtered and purified so it can be consumed. Using that information, students built water filters to address the guiding question, how would you cope in a water crisis?. Take a look at the students’ trials and errors. Our 50/50 model ensures that 50% of our students receive need-based scholarships to attend GCE. This diverse learning environment unites students and communities across Chicago with amazing success. Over the past five years, our graduates have been awarded an average of $100,000 each in merit-based college scholarships.